I’ve said before how much I enjoy the combined artwork of Paul Pelletier and Norm Rapmund. Three issues in and they show no sign of losing momentum; that’s refreshing. In this era of bi-weekly comic books, it’s common to see artists do only handful of issues. Granted, Batgirl is currently monthly, but the same often holds true for them as well. Overall, Batgirl is an enjoyable title. It’s familiar, but not bogged down in decades of continuity issues the way other characters might be. It’s enough to know the high points, and seeing how well the property continues to develop. She’s not quite an A-lister, and much of her credit is tied to the Bat-franchise. But the current series proves that in the right hands, she’s still a crowd-pleaser. But like another Bat-title this week, the narrative dips a little. 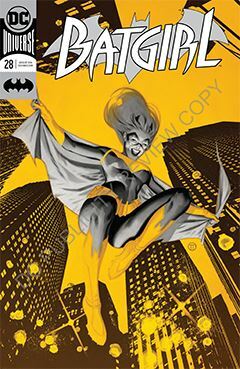 Batgirl is still challenged by the “new” Grotesque, and it should come as no surprise when his identity is revealed in this issue. We are also made privy to his end game, which comes as a major reveal – so major it reads as if writer Mairghread Scott just now thought of it. I should hope not. What this issue equally focuses on his Barbara’s healing. Not just her physical body and her continued ability to walk, but also the growing understanding between her and her father. I consider it effective character development, though my personal preference is to see it in a bit more minimized. Growth is an ongoing process, and we often experience “spurts” of understanding. I’m pleased to see DC avoiding emotional scenes in each issue. Occasionally is fine, but too many “very special moments” detract from the narrative as a whole.